One of my favorite aspects of serving as the History Unfolded community manager is all of the unexpected and wonderful connections that result from our networking efforts. This past spring, we reached out to Professor Elizabeth Heineman at the University of Iowa to let her know about History Unfolded. During our phone chat, Dr. Heineman told us about a project of her own, and we realized that we could help her as much as she could help us. At the University of Iowa, they are kicking off a year of programming on the topic of “German Iowa and the Global Midwest.” One chapter of the story is the arrival of refugees from Nazism to Iowa. In spring 2016, undergraduates in Dr. Heineman’s course on twentieth-century Germany researched the Scattergood Hostel in West Branch, Iowa, a town best known as the birthplace of Herbert Hoover, with a population of 719 in 1940. Run by the American Friends Service Committee, the Scattergood Hostel provided temporary shelter to some 185 refugees. Under the guidance of graduate assistant Dalton Michael Benson, the students dug into the Scattergood archive at the State Historical Society of Iowa. Holocaust Museum staff provided additional materials from the American Friends Service Committee archive in Philadelphia. One student, William J. Simpson, continued his research into the summer of 2016 and developed a virtual exhibit, which you can see here. 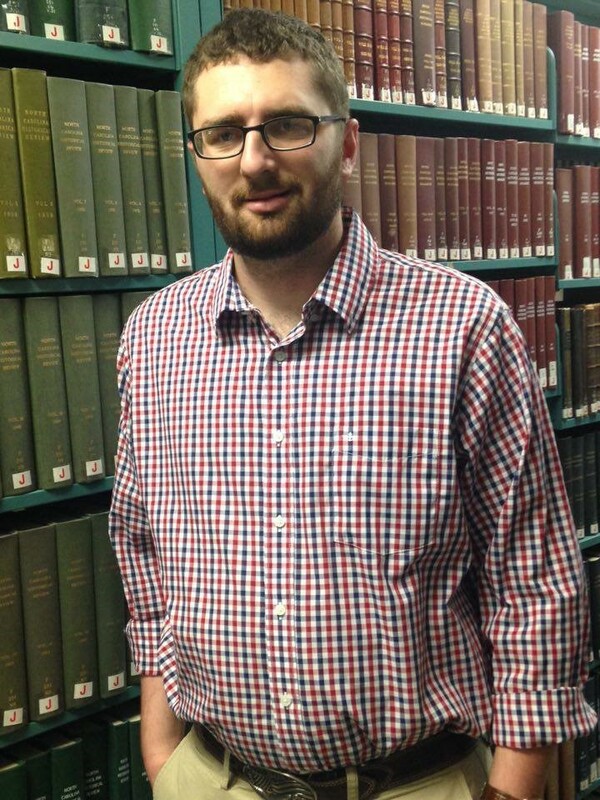 In his blog post below, William reflects on his experience as a novice researcher. 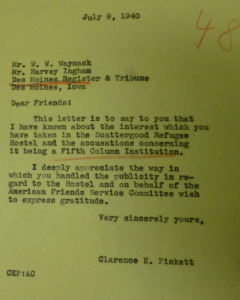 Recently, I was given the opportunity to research the Scattergood Hostel, a safe haven in Iowa for European refugees who had fled the Nazi regime. This was my first experience doing archival research and I was excited to start on a project that connected local Iowa history to world-changing events. On my first day, I showed up to the State Historical Society of Iowa (SHSI) and was immediately overwhelmed by the large number of documents they had on Scattergood. Every visit to the archives yielded a new discovery that would change my image of Scattergood. The Scattergood Hostel was a place of solace for those fleeing Hitler’s reach, but the refugees also faced challenges during their stay. To get to the full story of the Scattergood Hostel, I had to make countless visits to the archives and tirelessly pore over documents. I learned many things during my trips to SHSI, not just about Scattergood, but about archival research as a whole. I won’t lie, I made a few rookie mistakes at the beginning of this project. To help my fellow rookies avoid these mistakes, I’ve decided to share the three most important things you need to know. When dealing with such large amounts of information, it is imperative to be organized and to take meticulous notes. There were countless times where I would pass by a piece of information that I considered to be trivial, only to discover later that it was vital to my research. I would waste my time back-tracking through documents in order to find this information again. In my own research, I found multiple pictures of male refugees cleaning dishes at Scattergood. This did not seem immediately important, so I carried on. Later on I realized that in Germany it was very uncommon for a man to do the housework and it was discomforting to some of the male refugees to do these tasks. I then had to go back to find the pictures and add them to my project. Kurt Schaefer cleaning the dishes. State Historical Society of Iowa. Researching primary sources, such as what you find in an archive, is important to discovering new information. However, without context much of that information is diminished. You need to look into other sources in order to get the full story. Even though my project was on a small hostel that provided aid to 185 refugees, I needed to be well-versed in many topics. I needed to know about German gender roles in the early 20th century, the United States’ isolationist policies leading up to its entrance into World War II, Midwestern culture and views towards European refugees, and many other topics as well. Without that knowledge, I wouldn’t be able to accurately tell the story of Scattergood. Regardless of what the topic of your research is, you need to know the context. Books, journals, and other secondary sources are veritable fountains of knowledge. You may discover that you are not the first person to research this topic and that others can lead the way to more information. If you are the first person to write about a specific subject, use your secondary sources to build a foundation to work from. More knowledge can’t hurt and it may lead to a new discovery. When I started my research, I had a preconceived notion of what the story of Scattergood would be. I assumed it was going to be a happy tale of how Iowans came together and helped Jewish refugees. While that happy tale is a part of the story, there was so much more that was waiting to be brought to light. There were the struggles that the refugees faced as they were being integrated into a foreign society. They had to learn a new language as well as new job skills. They had to compete for jobs as the U.S. was in the tail end of the Great Depression. There was one professor from Germany who had to work as a ski instructor in Minnesota because there were no other jobs available. Another aspect of the story was that not all of the refugees were Jewish: many fled Germany because of their political beliefs. Also, the people of Iowa didn’t unite to help the people of Scattergood: there were some who did not trust the refugees. Every day, there is always something new that will change how you see your research. It doesn’t matter what stage of your research you are in. Even in the final weeks of my project, I was struck by something new. When I should have been wrapping up the editing of my project, I was provided files from the United States Holocaust Memorial Museum. In those files I found a document that provided evidence that Iowans were concerned about Scattergood being a “Fifth Column” institution (a group of people within the country supporting foreign enemies.) Though I knew about the distrust some Iowans had towards the refugees, I had not known that this was the cause. Nor had I known that the Des Moines Register and the American Friends Service Committee actively worked to dissuade these suspicions. A letter from the American Friends Service Committee to the Des Moines Register. United States Holocaust Memorial Museum. Hopefully these tips help out any rookies who are preparing for their first project. It may seem daunting, especially when you see the stack of files laid out before you. But with hard work and smart strategies, you will be able to take on the challenge. I can’t wait to see the amazing stories your research will bring to light.